The first graduating class of Weru Secondary School will receive their diplomas on November 30, 2019. Many of the graduates are children we first met as small children who had lost their parents to HIV/AiDS but none would have had access to secondary school education without our help. Construction is currently under way to complete the last dormitories and classrooms needed. Where the school began with a water pump from the stream below, they are now constructing a second water catchment tank to assure both drinking water and water for cooking and bathing. The kitchen is now in full operation with a vent for the smoke from the cooking fires and the dining hall functions as an auditorium and multipurpose room. The last word from Lawrence was after he completed all the necessary forms to give the school full national recognition. It has been a long road but one now filled with soon-to-be graduates. Lea Ngmau was the first child to receive the support of our congregation in 2006. She was eleven years old and her parents had died in an automobile accident. She and her 9 year old sister were living with her 90 year old grandmother in a typical village home, without electricity or running water. With our gifts of food, clothing and school fees over the past 9 years she was able to finish high school and was funded to attend a book-keeping program. When we visited in 2013 she coordinated the distribution of food to all the orphans. Her she is pictured with the youngest of the children we sponsor. 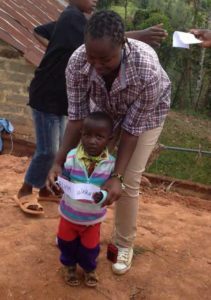 Alvin is 2 years old and his mother died of HIV/AIDS shortly after he was born. He lives with a neighbor. $100 provides a semester of schooling. Other gifts help us provide food, soap and oil to the guardians of the children. Please make checks out to GCC with “Kenya” in the memo line.